FORT LAUDERDALE, FL--(Marketwire - March 10, 2011) - MSC Cruises is featuring its own version of "March Madness" and guests who book on select 7-night 2011 European sailings by March 31 are the real winners. 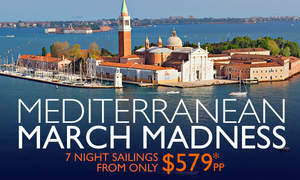 In addition to rates starting at $579 that are more than 60 percent off the brochure rate, those who book select Mediterranean cruises using "March Madness" rates will receive a stateroom upgrade of as much as two-categories within the same stateroom category. A long-time leader in the European cruise market, MSC Cruises' beautiful ships feature European style and ambiance, impeccable cleanliness, contemporary design and refined elegance as they take guest to some of Europe's most popular landmarks and most sought-after destinations. MSC Fantasia: April 22-Aug. 29 "Mediterranean Fantasy" itineraries departing Civitavecchia, Barcelona or Genoa; rates begin at $579. MSC Splendida: April 10-Aug. 28 "The Splendid Mediterranean" from Genoa or Barcelona; rates begin at $579. MSC Magnifica: June 4-Aug. 28 "Magnificent Mediterranean" itineraries from Venice or Bari; rates begin at $699. MSC Musica: June 26-Aug. 29 "Greek Islands in the Sun" from Venice or Bari; rates begin at $749. MSC Armonia: June 3-Aug. 26 "Jewels of the Adriatic" itineraries from Venice; rates begin at $799. Rates quoted are cruise-only, per person, double occupancy, and interior stateroom. Government fees and taxes are additional. The deadline to book using "March Madness" rates is March 31. MSC Cruises is the fastest-growing cruise line in the world with a fleet of 11 ships: MSC Magnifica, MSC Splendida, MSC Fantasia, MSC Poesia, MSC Orchestra, MSC Musica, MSC Sinfonia, MSC Armonia, MSC Opera, MSC Lirica and MSC Melody. The fleet cruises year round in the Mediterranean and seasonally in Northern Europe, the Atlantic Ocean, the Caribbean, US and Canada, (Fall 2010), South America, the Indian Ocean, and South and West Africa.